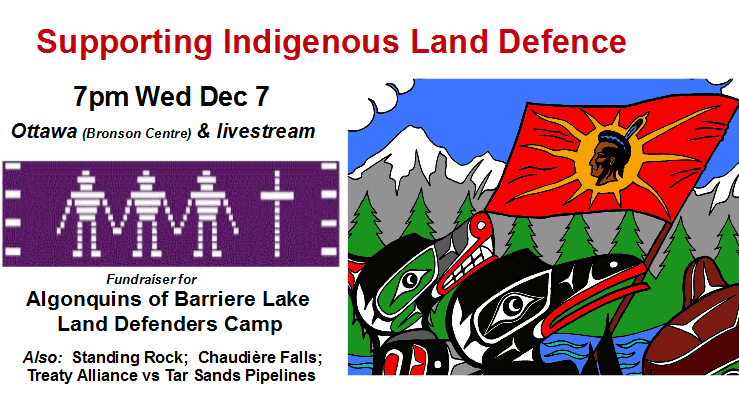 Update: An Indigenous Land Defence event will be held on Wednesday, Dec. 7 at 7 p.m. It’s in support of Standing Rock/#NoDAPL, the Chaudière Falls sacred site (in Ottawa), the Treaty Alliance against tar sands expansion and the Algonquins of Barriere Lake No Mining! Land Defenders Camp. Featuring speakers and multimedia, the event takes place at the Bronson Centre (211 Bronson Ave.), but will also be livestreamed. See IPSMO’s website or Facebook event page for details. Funds are being collected for the Algonquins of Barriere Lake land defence efforts. Last week I posted about some of the actions happening in Ottawa in support of people and groups in Canada, the U.S. and Indigenous territories defending land and water against destructive development. 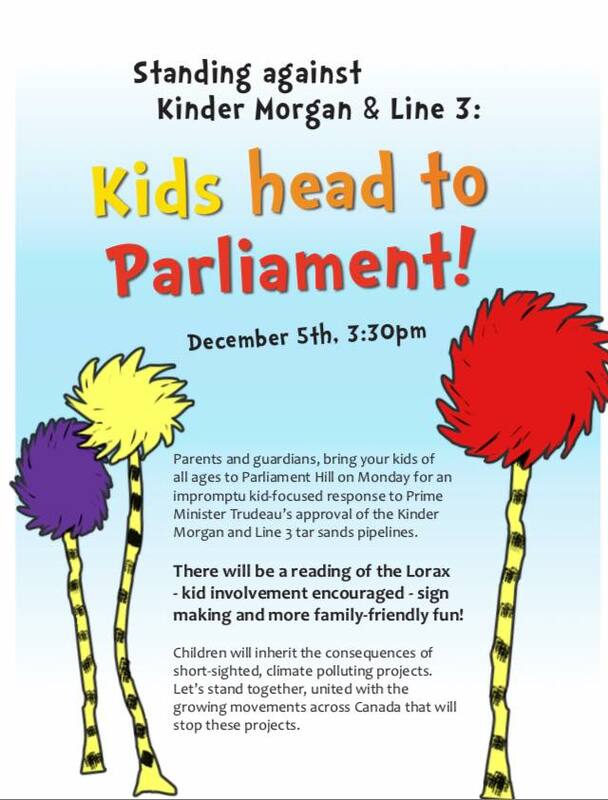 Prime Minister Trudeau approved the Kinder Morgan and Line 3 tar sands pipelines. If just one of these pipelines is built, it will unleash enough climate pollution to undo the proposed phase out of coal, the carbon tax and the low carbon fuel standards combined, and then some. These pipelines are strongly opposed by Indigenous communities along the route. A spill threatens drinking water and coastal waters including critical Orca habitat. POSTPONED: Also, the Indigenous Peoples’ Solidarity Movement Ottawa is organizing a #NoDAPL Day of Action in Ottawa, from 1-3:30 p.m., starting at the fountain in Confederation Park. It’s a response to the Camp of the Sacred Stone‘s call for a month of global resistance against the Dakota Access Pipeline. From IPSMO’s event post: “Based on Global Calls for Action, we are organizing a Non-Violent Direct Action to publicly ask Banks to divest from the Dakota Access Pipeline (DAPL).” See important details and updates on their post. The David Suzuki Foundation has posted a letter that people can sign asking the federal government to rethink its approval of the pipelines. For an analysis of the flaws in the pipeline approval process, and the adverse affects that moving ahead with them will have, see this article in The Tyee.